The holidays are here and chances are you will need or want a great appetizer for a party you are hosting or a family dinner. 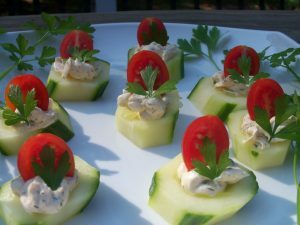 These Cucumber Tomato Bites are perfect to wow your guest with presentation and flavor and can be made ahead time. Win win! Fresh cucumber with a cream cheese filling seasoned with garlic, Parmesan and spices topped off with a fresh tomato slice. Enjoy! In a large mixing bowl beat all ingredients except cucumbers and tomatoes until smooth and creamy. Set aside while you prep the cucumber and tomatoes. Gently hollow out a small scoop of the cucumber slices with a melon baller. Spoon or pipe herb spread on top of cucumber slices. Top each bite with one tomato half and a small leaf of parsley. Cover and refrigerate until ready to serve. I served these for my ladies bible study the other day. Everyone loved them. They disappeared off the plate in a hurry. I will definitely make them again. Thanks for all the work you do on putting these receipts and beautiful pictures on your site. Oh, I’m glad they loved them! It’s my pleasure to share my passion for food.